Since coming on to replace his father Arnor as a 17-year-old substitute in 1996, Eidur Gudjohnsen has spent most of his 19-year international career as Iceland's most celebrated player. But playing in the finals of a major tournament with a country that three years ago was ranked below perennial also-rans Liechtenstein and Luxembourg always felt like a "distant dream" for the nation's only Champions League winner. Gudjohnsen, now 37, is at last aiming to realise that ambition at next summer's European Championship. It would be a remarkable story if he were to play in France - but then again, his nation has recently been specialising in the remarkable. In finishing second in their qualifying group, seven points clear of Netherlands, Iceland became the smallest nation ever to reach a major tournament, and the first to do so with a population below one million. Its inhabitants number just 329,000 - not many more than live in Coventry. Even El Salvador, beaten 10-1 in their opening game at the 1982 World Cup, had a population of more than four million backing their team, while Wales - who ended a 58-year wait for qualification last month - has nearly 10 times as many people as Iceland. "The older you get in footballing years, the further away you get from realising what is a boyhood dream," Gudjohnsen told BBC Sport. "But then when it happens it makes you feel proud and privileged just to have been part of an amazing campaign." So how did a country with such limited resources make it to the Euros? Read about the nations that have qualified for Euro 2016. Gudjohnsen owed his progression beyond the normal bounds of Icelandic football to his father Arnor's career in Europe. The seven years Gudjohnsen Sr spent at Belgian side Anderlecht allowed the young Eidur to develop away from the harsh winter climate and mountainous terrain of his homeland, where football outside the four- or five-month summer period meant small-sided games on hard indoor floors. But much like the prospective plans put forward by an English Football Association commission in October 2014, Iceland's football association (KSI) has overseen massive investment in changing that in the past 15 years. There are now 30 full-size all-weather pitches, seven of which are indoors, and almost 150 smaller artificial arenas that ensure youngsters at grassroots can continue to play football in winter, often inside indoor dome structures. 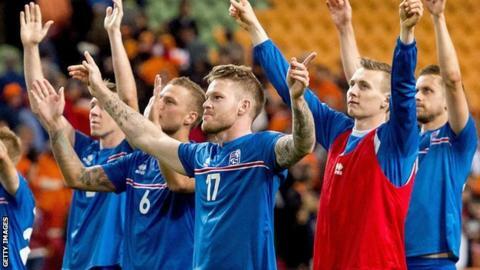 It is why the current crop of players, many of whom made history by qualifying for the European Under-21 Championship in 2011 - Iceland's first foray into any major international tournament - have been labelled "the indoor kids". "For this nation, the dome pitches were a revelation," Heimir Hallgrimsson, the national team's joint head coach, told BBC Sport. "Every village wanted an artificial pitch, and there is now one close to almost every school in Iceland. "These guys now with us in the national team were brought up on artificial pitches. Many would have had youth coaching in an indoor dome. They could go out if the weather was good, but they always had good facilities to train." Despite Iceland having no professional club sides, there is an extraordinarily high number of qualified coaches in the country, with 639 people holding a Uefa B licence, according to recent KSI statistics. It means even youngsters living in the tiniest provincial fishing village in Iceland can benefit from a state-of-the-art, all-weather pitch and a trained coach. Hallgrimsson, 48, spent his entire playing career in Iceland and balances his coaching commitments with part-time work as a dentist, but he recognises the appeal of the coaching profession for Icelanders. "Every town or village in Iceland wants to have a good football team for the parents and for the kids, and it is easy to train as a Uefa A or B licence coach here," he noted. "I took my Pro Licence in England and I looked around. Of course it is a professional set-up for the big clubs there, but it's mostly parents or some guy who takes over and works with the kids who play on Sunday. "I think that's the difference. We teach our kids from a young age and we give them good sessions with trained coaches, so that's why we get a lot of young players going abroad early, at 17, 18, 19, which they have to do to continue their development professionally." At 26, Swansea's Gylfi Sigurdsson is now the focal point of the Iceland team and a typical example of his country's youth development policy. Sigurdsson was signed by Reading as an under-17 international in 2005. He had loan spells with Crewe and Shrewsbury before moving to Hoffenheim in the German Bundesliga and impressing sufficiently to make a high-profile return to the Premier League with Tottenham. "If you look at Gylfi for instance, he was in a lot of clubs and he still didn't miss out. Even if he didn't succeed from the beginning, now he's a really good player," says Iceland's other joint head coach, Lars Lagerback. "I think it's in the country's culture - they're used to working hard and taking care of themselves, so it's a really nice group in that way to work with." Lagerback - "I am not a hero, Nelson Mandela is a hero." Lagerback, 67, led his home country of Sweden to an unprecedented five major tournaments in a row, and reckons the achievement he and Hallgrimsson have manufactured with the tiny Nordic isle is "a little bit special". Their qualification has come two years after a play-off defeat by Croatia denied them a first World Cup appearance in Brazil, following a group campaign in which they had finished runners-up behind Switzerland despite being drawn as one of the lowest seeds. "Of course we were very disappointed losing to Croatia, but I think when we restarted again everyone saw it as a good first step," Lagerback said. "We tried to put it that way and even if we thought we ended up in a tough group for the Euros, we always said if you give 100% in preparation and during the game you can always win in football." Gudjohnsen announced his retirement from international football following the Croatia defeat but was lured back just 18 months later, sensing his long-held ambition could still be fulfilled. For two consecutive qualifying campaigns, the management team have got the best out of a group of players who qualified for the European U21 finals in 2011. They are players, now approaching their mid-20s, who have now got the better of the Netherlands in home and away matches, as well as dismantling Turkey 3-0 on their way to qualification from what on first viewing was an intimidating group. And they are players that have grown up idolising Gudjohnsen and his role in giving Icelandic football an identity both in England's Premier League with Chelsea and across Europe at Barcelona and Monaco. "You do have a sense that some of these players look up to me," Gudjohnsen said. "They grew up watching me play probably - probably played with me on the PlayStation as well. "It is strange, but once you get into training and on the pitch these things tend to be forgotten very easily and I'm still just one member of the group. "We're all fighting for the same thing. It's a great experience but I've hoped they've enjoyed playing with me as much as I have with them because it's been a breath of fresh air for Icelandic football." The former Chelsea striker still enjoys iconic status in his home country, but has had to make do with substitute appearances in Iceland's final qualification games and has missed out on a place in the squad for the side's friendlies with Poland and Slovakia this weekend. After his spell back at Bolton Wanderers in the Championship last season, during which he scored six goals, Gudjohnsen moved to Chinese side Shijiazhuang Ever Bright in July. But following the conclusion of the Chinese Super League season he is now seeking a new club in the hope he can reach and maintain the fitness levels required for tournament football. "I'm looking at a few options now," Gudjohnsen said. "I think it's fair to say it would be best to be playing in Europe, to try and play at the best level to be as fit as possible when the tournament comes. "The success of the national team has been one of the key factors in me just continuing. It's been a motivation to keep me going until at least next summer. "But in saying that I just love the game too much, it hasn't been difficult to keep motivating me to keep playing. This has just been a nice bonus, a little extra at the end."